"Great wine begins in the vineyard". A truism if ever there was one. It is indisputable that wine quality is inextricably linked to where the grapes are grown. The balance of ripeness and acidity, and the interplay between aroma and flavor, are largely determined by climate. 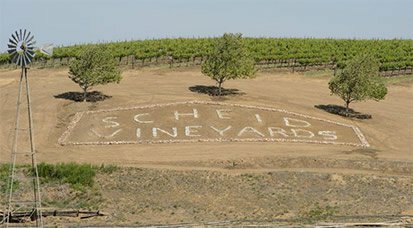 When Al Scheid first purchased property in Monterey County in 1971, he did so based on the advice of Professor A.J. 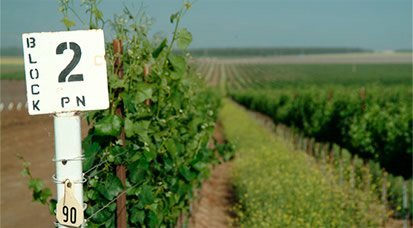 Winkler, a viticultural authority from the University of California at Davis, who classified grape growing regions by climate. Monterey County was classified as Regions I and II, comparable to Napa, Sonoma, Burgundy and Bordeaux. 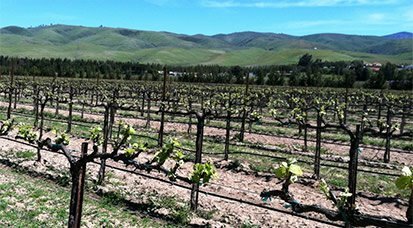 Flanked by the Gabilan mountain range to the east and the Santa Lucia Mountains to the west, the Salinas Valley maintains its cool coastal conditions due to the influence of the Monterey Bay. Under these waters lies the deepest submarine gorge on the west coast of the United States, known as the Monterey Canyon. As massive as the Grand Canyon, this steep, twisting phenomenon almost perfectly bisects the seafloor of the Bay and causes a condition called upwelling. Upwelling brings the frigid water of the deep sea to the surface, cooling the marine air that hovers over the Monterey coast. Each day, the rising hot air from the Salinas Valley pulls the chilled marine air down its corridor. This cooling down effect allows grapes to ripen more slowly and evenly, resulting in a growing season which can be up to two months longer than other wine growing regions. Winegrowers call this lengthening of the growing season "hang time". Increased hang time leads to exceptional wines that exhibit intense fruit flavors, deep color extraction, and full varietal expression. 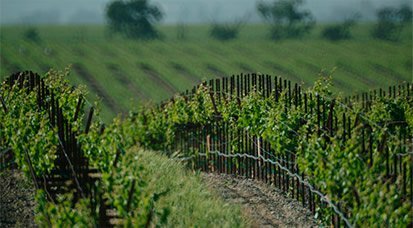 Our eleven estate vineyards are located along a 70-mile spread of the Salinas Valley, encompassing four primary climate zones. 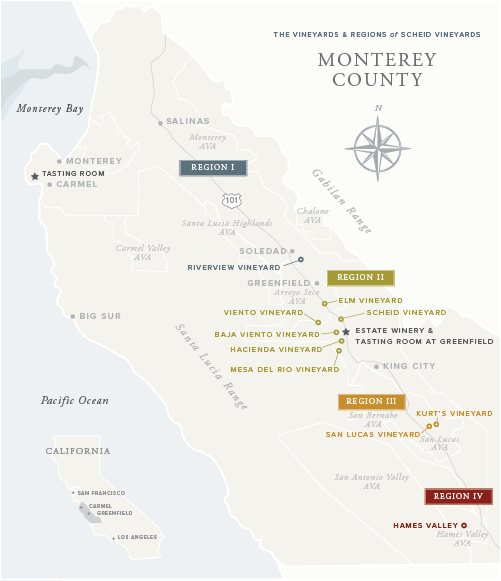 The unique geography of Monterey County and the diversity of our estate vineyards allow us to grow many different varieties in a spectrum of styles. Each of our 39 varietals is planted in the location or locations that is best-suited to expressing the highest quality for that grape. Designated by our mineral blue label, this is the cool climate area of northern Monterey County, where the morning fog often lingers until mid-day. In this coolest of our growing regions, the yields are low. Known for producing elegant, layered wines of delicacy and balance, it is the ideal spot for ultra-premium Chardonnay and Pinot Noir. The Chardonnay displays a flinty, mineral character, revealing a very Burgundian flavor profile. The Pinot Noir is typified by vibrant red fruit, complexity and a lush quality. Designated by our green label, this is the Greenfield area, known for foggy mornings and cool afternoon winds. These conditions produce wines of intense varietal character and vivid aromas. The mean annual air temperature is about 60°F and evening coastal fogs in the spring and summer often linger until mid-morning the following day. The result is a longer growing season than other premium areas and wines that are typified by vibrant fruit character and balanced acidity. Designated by our amber label, this is the San Lucas appellation, with sunny days tempered by cooling ocean breezes. Here, the days are warmer and longer, yet cool down quite dramatically when the sun goes down. Fruit-forward and softly-textured wines are the hallmark of this region, known for producing an outstanding array of varietals. Designated by our burgundy label, this is the Hames Valley appellation, known for long, warm days that make this an ideal area for sun-loving reds. This region produces balanced, full-bodied wines of intensity, such as Petite Sirah, Petit Verdot and Malbec.